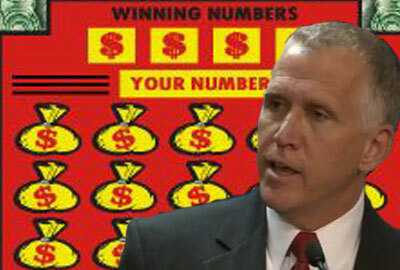 House Speaker Thom Tillis (R-Mecklenberg) unveiled his party’s revised budget proposal for 2014, which includes an average five percent raise for teachers without forcing them to give up their career status – but he plans to pay for the teachers’ raises with revenues from the state’s lottery. “This budget has an average five percent pay increase for all teachers, honoring the commitment that we made back in February to get our starting teacher salaries up to regional competitiveness in the first year and to more or less the national average in the second year,” said Tillis at a press conference Tuesday morning to promote his budget proposal. “And we’re doing it in a way that isn’t necessarily at the expense of other educational cuts,” Tillis said, emphasizing that the House doesn’t include severe cuts included in the Senate’s plan, which would offer teachers an eleven percent raise but would also eliminate second and third grade teacher assistants from the classroom, cut the Department of Public Instruction by 30 percent, and reduce the number of badly needed school nurses around the state, among other cuts. Instead of slashing education to pay for teacher raises, Tillis wants to draw on increased revenues from the state’s lottery–which has Democrats, and even some Republicans, concerned about the prospect of relying on a more volatile and unpredictable funding stream to pay for statutorily guaranteed expenses. On its face, the House budget proposal seems to serve as the peacemaker between the starkly different budget proposals already put forth by the Senate and the Governor. The Senate plan would give teachers, who have suffered from no significant pay raises for more than five years, an 11 percent pay raise. But that raise would come at a price – teachers would have to give up their career status, also known as tenure, in order to get the salary increase. The Governor’s plan offered a small two percent raise to teachers, with no strings attached. The House plan would come closer to McCrory’s proposal, offering teachers a five percent raise and allowing those who have tenure to hold onto it until it is either phased out in 2018, or indefinitely — depending on what is ultimately decided in the courts. The Senate planned to pay for their large teacher raises by gutting funds for teacher assistants. More than $200 million would have been siphoned away from the budget for TA’s, effectively eliminating them from second and third grade classrooms. 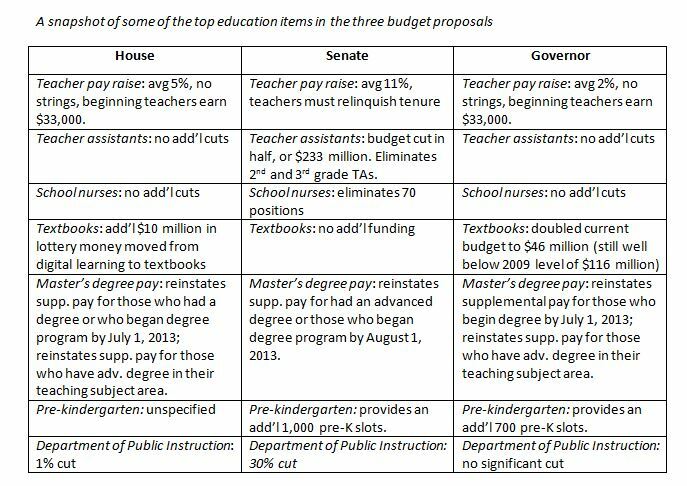 The House proposal keeps the previous year’s budget intact for teacher assistants, but does not add any new money, even though TA’s have suffered deep cuts in prior years. The House also keeps funding in place for school nurses, who are already underfunded. The Senate plan proposed to cut 70 nurses from local school districts, putting rural areas in especially dangerous predicaments. Another addition to the House budget proposal worth noting: $300,000 for a rural charter accelerator program that would be operated by Parents for Educational Freedom NC (PEFNC), one of the largest proponents of charter schools and school vouchers in North Carolina. Lawmakers tried to insert funds for the rural charter accelerator program last year, but the provision did not make it into the final budget. The House budget proposal relies on around $150 million in increased revenues from North Carolina’s lottery to fund the proposed five percent raise for teachers and more slots for pre-kindergarten. Rep. Rick Glazier (D-Cumberland) took issue with using lottery funds to pay for ongoing education expenses. “This is not what the lottery was intended to do,” said Glazier, who explained that lottery funds were initially intended to supplement education funding, not supplant it. To increase revenues, the House budget proposes doubling the lottery’s advertising budget from one to two percent. Herb Delehanty, owner of Delehanty Consulting LLC, the firm that conducted the North Carolina lottery’s performance audit on which lawmakers relied when projecting how much revenues they could count on by increasing their advertising budget, cautioned that while doubling the funds for advertising would bring in more revenue, it’s not a dollar for dollar proposition. To complicate the issue, lawmakers inserted language into the budget bill that would improve truth in advertising for the lottery. That had Rep. Debra Conrad (R-Forsyth,) who owns a marketing consultancy, scratching her head. “If you’re spending twice as much money on advertising but you are coupling that with truth in advertising language, I would think that they would negate each other out” said Conrad, who said she doesn’t understand the logic behind using additional lottery revenues to fund an ongoing expense like teacher pay. Rep. Craig Horn (R-Union) defended the move during a meeting of the Appropriations Subcommittee on Education Tuesday, asserting that he didn’t like the lottery to begin with, but now that it’s here, the state should use the funds for education. In North Carolina, counties saddled with the state’s highest poverty rates also have the highest numbers of lottery players in the state, according to a 2012 report by N.C. Policy Watch reporter Sarah Ovaska. House lawmakers also shuffled around the $11 million set aside in the budget for Opportunity Scholarships, frequently known as school vouchers. Previously, public school funding for local school districts was decreased by $11 million in the 2014 budget to account for funding the school voucher program, which will provide approximately 2,400 current public school students with $4,200 vouchers to attend private schools beginning this fall. Lawmakers put the $11 million back into the public school budget, meaning they will have to draw the funds from somewhere else in the $21 billion budget to pay for the voucher program, which was temporarily halted by a superior court judge in February, but that decision was reversed by the state Supreme Court a few weeks ago. The North Carolina Association of Educators and the North Carolina School Boards Association have challenged the school voucher program in court, alleging that the program is an unconstitutional use of taxpayer funds that should be used for public schools only. Rep. Glazier tried to remove funds for the voucher program with an amendment yesterday during the House Appropriations Education subcommittee meeting, but his attempt failed. Glazier also put forth an amendment that would prevent private schools that receive vouchers from discriminating against students on the basis of race and sexual orientation. That amendment also failed. 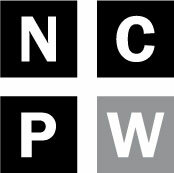 “The voucher provisions that remain in the budget are unconstitutional,” Glazier told N.C. Policy Watch. The House plans to pass their budget proposal this week, and both the Senate and the House will convene in conference committees to hammer out a compromise next week. Education reporter Lindsay Wagner can be reached at 919.861.1460 or lindsay@ncpolicywatch.com.